The traveling exhibition ¡Azúcar! 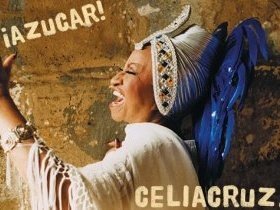 The Life and Music of Celia Cruz explores the life of legendary Cuban-born singer Celia Cruz (1925 – 2003) and her world-wide influence on music and culture. The exhibition, organized by the Smithsonian’s National Museum of American History, made its debut in Washington, D.C. ¡Azúcar! highlights important moments in Cruz’s life and career through photographs, personal documents, costumes, rare footage, and music. The show will include items from her childhood and early appearances with the band, La Sonora Matancera, in Cuba. ¡Azúcar! The Life and Music of Celia Cruz has been organized by the National Museum of American History. ¡Azúcar! The Life and Music of Celia Cruz has been made possible by National Sponsor Morgan Stanley with additional support from the Smithsonian Latino Center.